This Brass Spigot is wonderful for completing your piece. We order these spigots from a very reliable supplier. We recently received a notice from a California Law Firm claiming that California’s Proposition 65 requires that brass spigots have a warning label when it is sold in California. The law firm claims that if there is any level of lead in the spigots they must have this warning label. 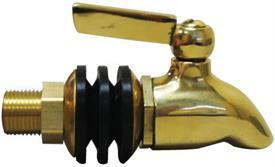 In talking with our supplier we found out that all brass spigots have some lead in them. Our spigots have 3.3% lead, with 96.7% being the other metals making up the remaining parts of our spigots. It is only required to put these warnings on the spigots sold in California but we have chosen to let all of our customers know about this small content of lead. This letter also provides more information about the California law. California’s Proposition 65 has been called the world’s strictest “right to know” law. California keeps a list of substances that cause cancer or reproductive toxicity, and requires businesses to warn people before exposing them to a substance on the list. Lead is listed as one of the more than 750 substances designated a carcinogens or reproductive toxicants. Proposition 65 requires a business to notify its customers and warn them, if the business know that lead is in the product. You can read more about this law on California’s website, www.oehha.ca,gov/prop65/p65faq.html. The web site provides a summary of Proposition 65, regulations. Here is some more information about brass and food safety: The United States Food and Drug Administration, Public Health Service, and Department of Food and Agriculture jointly publish the US Food Code, which is available online at http://www.cfsan.fda.gov/~acrobat/fc05-4.pdf. Section 4-101.4 says that copper alloys such as brass should not contact vinegar, juice, wine, and other acidic foods. So we do not recommend you use our spigots with those liquids.